The pets that we share our homes with are not just mere animals, but true members of the family! Whether it is a dog, cat, bird or other creature, these special beings have a way of making their place in the house and in the heart. As with any other valued family member, we want our pets to be as much of an active part in our day to day lives as possible. From playing in the backyard to exploring the wilderness, we all feel better knowing that they are enjoying the experience with us rather than sitting alone at home. Our Recommendation: HPZ Pet Rover. Read the review below for more information or click here to check it out on Amazon. Dogs, in particular, are a species that love to be by our side at every opportunity. And yet, as much as we want our canine companions to be with us as much as possible, we need to make sure that they comfortable and safe at all times. Just as a stroller makes it easier for parents to take their small children out on walks, runs and/or hikes, dog strollers are the good way to make sure your dog travels with you in style, safety, and comfort. In this post, I will review the top best dog stroller for hiking. I will also explain the benefits of owning a pet stroller, and how to pick the right one. Why Should You Get A Dog Stroller, Anyway? First and foremost, it allows you to include your dog in activities such as hiking and jogging that they may otherwise not be able to do. This is particularly true in the instance of older dogs with arthritis or dogs who are recovering from surgery or other medical procedures. Having a dog stroller means that your furry friend can rest and relax while still getting outside and breathing in the fresh air. Dog strollers also protect your pet from the elements, such as rain and ultraviolet rays as well as biting and stinging insects. Another major benefit is that a dog stroller places a barrier between your dog and the outside world. This means that pets who tend to experience anxiety in social settings may feel more comfortable in the safe haven of the stroller. Additionally, the stroller places your dog in an elevated, protected situation from other dogs that may be aggressive. How To Choose The Right Dog Stroller For Hiking? Which kind of dog stroller you purchase depends upon your needs. Some dog strollers are meant for traveling on even surfaces, such as in the mall, around neighborhoods, in hotels, etc. All-terrain strollers are ideal for taking on uneven surfaces, such as those that would be seen while hiking! Travel strollers typically have four wheels, while hiking strollers have one wheel in the front and two in the back to allow for maximum maneuvering. The best dog strollers for hiking also have superior suspension when compared to other models and larger tires, all of which makes for a smooth ride. First, the dog stroller should be made of a durable yet lightweight material. This makes it so that you can easily set it up and push it along, while also knowing that the product can stand up to everyday use. Second, some dog strollers have removable cushions which allow your dog to rest comfortably. Preferably, these cushions will be made of an easy to clean material. You also want to be sure that the suspension system is of high-quality, which allows for a smooth, non-jostling ride. Finally, while your preference may be different, I find that dog strollers with a No-Zip feature are very convenient. Instead of having to fumble with zipping and unzipping every time you want access to your dog, you can quickly slip your hand in and out as often as you’d like! This dog stroller features one of the most convenient inventions within the field with a patented No-Zip advantage, as well as Air Ride tires for ultimate comfort. The Pet Gear No-Zip is easy to assemble and allows your dog to fully enjoy its surroundings with an adjustable canopy and wide-encompassing window. This means that your dog can more fully enjoy the experience by seeing what is on their peripheral vision rather than what is straight ahead. Plus, the front shock absorbers and rear brakes make this an ideal choice for minimizing jolts in sand, mud or other uneven terrains. Made from a rugged 600 Denier material, this dog stroller’s waterproof design makes it a champion for adventure in all sorts of weather. The material makes it easy to clean both the inside and outside parts and it is extremely easy to use as well (folding and unfolding with one hand). This product is manufactured by Pet Gear Inc., which split off from Vermont Juvenile Furniture to form a group of goodies geared towards those who consider their dog their child. Along with the stroller itself, the product includes a parent tray for water, as well as a large basket that can be used to store treats and other objects. This is an awesome dog stroller for active families, as well as for those who like to venture off the beaten path. It allows your dog to ride in comfort over rougher terrain, and its No-Zip feature allows you to reach in and out of the stroller freely without having to fuss with a zipper. This is a two in one dog stroller and trailer combination that allows you and your dog to go hiking and even biking together. Safety and comfort are the most important features of this pet stroller. A hand-lock brake ensures that the stroller will not roll away when you stop on a hill or other uneven ground. There is also a brightly colored safety flag and built-in reflectors to provide the best visibility possible. This means that your dog’s stroller/trailer will be visible to others even in lower light conditions. A mesh screen creates a barrier between your dog and pesky biting insects, while a removable cushion ensures comfort even on longer trips. Made from steel, the stroller frame is both durable and lightweight, and the water-resistant polyester material makes it easy to clean as well. This stroller is manufactured by Best Choice Products, an online shopping company that prides itself on providing customers with low prices by acting as the direct middle-man between the factory and the customer. Included along with the pet stroller is a soft, comfortable cushion that can be taken in and out for cleaning, along with a universal hitch to attach to your bicycle. Not only is this product a perfect choice for those who like to walk and hike with their dog, but it is also wonderful for taking your canine companion on the bike trails. The additional safety features mean that you can rest assured that you and your pet can go on journeys together without having to worry about being seen by others. As its name suggests, this is a tough, rugged dog stroller that can hold more weight and take far more abuse than other models. With an extra thick frame that is still lightweight and easy to maneuver, the Pet Rover allows you and your dog to fearlessly take on more rugged terrain. The stainless-steel tubes which are used to construct the frame allow for it to flex, meaning that you do not have to worry about the product breaking. Even while navigating uneven or rocky ground, your dog will ride like royalty, as the stroller is equipped with an anti-vibration system that absorbs shocks and smooths out bumps and jarring. Extremely convenient, you can easily unfold the stroller with one hand, and its compact size makes it easy to fold and store away when not in use. The mesh top reflects ultraviolet rays away from your dog, and the dual pads are easy to clean and stain resistant. Additionally, this stroller has a zipper-less entry and it can be modified to accommodate dogs of different sizes simply by altering the inner compartment. Those who like to hike with many accessories will love the extra storage space located underneath the stroller as well. This product is manufactured by HPZ, a company which prides itself on providing quality products along with an extremely high rate of customer satisfaction. The product comes with two removable pads, as well as an instruction book. This is a wonderful choice for those who tend to be a little rougher on things, yet still want a product that looks nice and can stand up to heavy use. Likewise, it is an excellent choice for those with larger dogs. This pet stroller is specifically designed for the active lifestyle. With No-Zip technology along with Air Ride suspension, this is a great choice for including your dog in your daily exercise routine. The No-Zip technology means that you can reach your hand in and out of the stroller in seconds rather than having to fuss with zipping and unzipping. While the Air Ride suspension makes for a smooth, comfortable ride for your dog. As this feature also allows the front wheel to lock, you are able to have more control over the stroller as you jog or hike. The panoramic viewing window allows your dog to see in every direction, along with an elevated paw rest that provides even more comfort. Made from sturdy, lightweight material, this stroller is easy to fold and unfold, and the mesh screen provides protection from insects while still allowing your pet to feel as though they are truly outside. 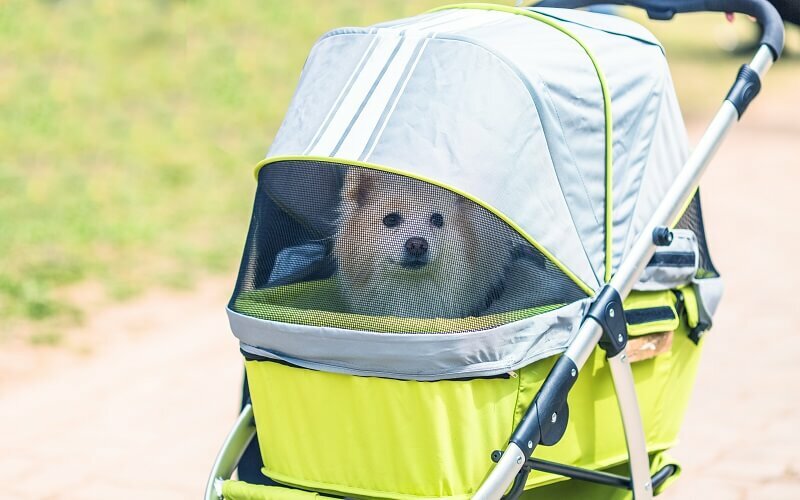 This stroller is manufactured by Pet Gear Inc., a company that prides itself on constantly finding new products to farther enhance the lives of animals and their human companions. The stroller comes with a portable air pump, as well as a sizable storage basket and smaller trays for personal products. If you love to jog with your canine companion, this is the perfect choice for you. Not only can you explore rougher terrain without worrying about your dog’s comfort, but you can also rest assured in the quality of the brand and its materials. Pet strollers are an absolutely awesome addition to any family with a dog. They provide your pet with the opportunity to accompany you and your family on outside adventures in a comfortable and safe manner. For me, the best dog stroller for hiking is HPZ Pet Rover. Click here to check it out on Amazon. For elderly or disabled pets and those who are recovering from illness, a stroller allows to actively engage in outside activities without causing farther damage to their health. While there are many different features to consider when choosing the pet stroller that is right for you and your dog, be sure to look for quality materials, as well as convenient features.